The Capital is under the hands of a new talented Chef, Eric Chavot. 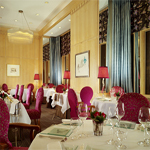 It delivers an excellent French-International Cuisine in a sophisticated décor in Knightsbridge. The wine list is quite expensive. Set lunch starts at £29.50 for three courses.